The Museum of Ice Cream in Los Angeles has become such a popular place that online sales are currently paused and tickets are currently unavailable for the rest of the year. The museum is full of themed rooms including the California room in which the first sample of ice cream is offered to guests. Also popular is the sprinkle pool full of antimicrobial plastic sprinkles that are cleaned daily. The official website of the Museum of Ice Cream states it is not actually a museum, but maintains similar ideals. “A museum, in our opinion, celebrates creativity, passion, history, innovators and innovations and we created Museum of Ice Cream in this spirit. While we are neither a non-profit nor an official museum, we are built upon the foundation of sharing and celebrating imagination,” the site states. 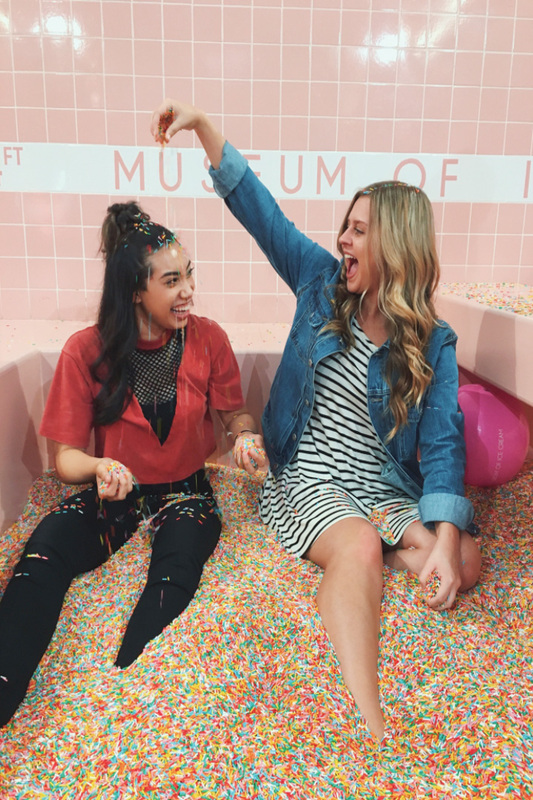 While the museum is not selling tickets at the moment, it maintains a vibrant presence on social media, namely Instagram, for the colorful rooms full of creative ice cream props that make for great photo opportunities. The museum knows it is ideal for pictures, so it encourages photography. Justine Tiu, graduate student in instrumental performance, had the opportunity to go to the Museum of Ice Cream while it was still offering tickets. Tiu said she followed her curiosity after seeing a photo on Instagram and bought tickets with her friends. She said before starting the tour of the facility, there was a room with telephones plugged into the wall, which explains the course of events about to take place. “When you first walk in, it’s pink and they have a phone and the phone is telling you, ‘This is what’s going to happen.’ ‘You’re in one room for maybe three minutes and then you go to the next room,” Tiu said. Abraham Sanchez, senior music composition major, went with Tiu to the museum and noted the plethora of opportunities to take pictures. “You walk in and there’s a hall with a bunch of bananas, gummy bears made of plastic and stuff like that just to take pictures,” Sanchez said. Josh Armagost, senior music performance major, also visited the museum and said he enjoyed the dessert that comes with the tour. “They’ll give you ice cream or something in just about every room. It’s fun. It has an artsy design and it’s really cool,” Armagost said. While tickets are not available for 2018 yet, prospective visitors can sign up to join their newsletter and the Museum of Ice Cream will continue to keep up its Instagram account and give tours.